What Happens When You Get ‘Throttled’? Lesson one: It's pretty easy to use up all of your wireless data service for a given month. Lesson two: When you do that, the phone company says that it'll knock your speed down into 2G territory--and it's not kidding. 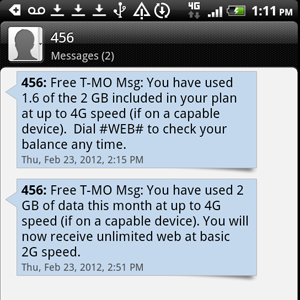 For this test I intentionally maxed out my T-Mobile data plan by downloading some movies from the Internet Archive. It took only two movie downloads for me to reach my plan's 2GB limit. The movie I was downloading did finish successfully, and I didn't notice an immediate change in the download rate after I had passed the limit. "You have used 2.0207 GB." My plan was to max out my data allotment and then check my throughput speeds every day for a few days to see whether the carrier would gradually reduce my phone's data transfer rate to 2G speed, or whether it would immediately throttle the rate down all the way. The second hypothesis turned out to be the true one. As you can see, when I tested throughput a couple of hours before I maxed out my data plan on February 23, I was getting pretty fast service. At about 2:51 that afternoon, I received the text from T-Mobile informing me that I'd passed the limit; shortly thereafter, my phone's download speed dropped from almost 8 megabits per second to 0.07 mbps. At that slow speed, a Web page that had taken just a few seconds to load before I hit the limit instead took 17 seconds to load. A 1-minute YouTube video that had taken about 1minute, 3 seconds to load and run all the way through now took 4 minutes, 35 seconds. Connecting with the Android Market and downloading an app from it took so long that I gave it up as not worth doing. To have my 4G speed restored for March, I'll have to pay my regular monthly bill early. Starting with AT&T, most carriers have done away with unlimited data plans. Sprint is the only carrier clinging to the truly unlimited concept, but even it requires subscribers to pay a $10 "data fee." AT&T and Verizon have adopted tiered pricing plans for data, under which they charge hefty overage fees if you exceed your monthly allowance. AT&T even decided to throttle subscribers who are still on one of the old unlimited data contracts. And why not? With just four national carriers accounting for almost all U.S. subscribers, the nation's wireless market isn't very competitive. Among the "Big Four," competition isn't especially strong, either: AT&T and Verizon claim a combined 85 percent of the business. So they don't have much market incentive to offer unlimited anything. Sprint can be seen as the insurgent here, but the company is so troubled--financially and technologically--that the other large carriers aren't inclined to view its unlimited data plan as much of a threat. Most people in the industry believe that Sprint will eventually capitulate and end its unlimited data plan in favor of a tiered scheme with overage charges. In fact, Virgin Mobile--the low-price, prepaid leg of Sprint--has announced that it will begin throttling down users who exceed 2GB a month, beginning March 12. Wireless carriers have found that it makes economic sense to impose tiered pricing systems on customers, and to profit when customers use too much data. For cover, the wireless carriers have invoked a tried-and-true "sky is falling" scenario, saying that putting restrictions on data use is essential to preserving network capacity in the face of skyrocketing data demand and a dearth of available wireless spectrum. There may be some truth to this cover story, but the carriers' abandonment of unlimited plans probably has more to do with maintaining healthy profits. The research firm Validas recently reviewed the phone bills of 11,000 users and found that the data usage of so-called "bandwidth hogs" on both restricted (throttled or tiered) and unlimited plans was effectively the same. It appears that data usage restrictions don't even serve the goal that the carriers identified for using them--namely, to preserve network capacity.